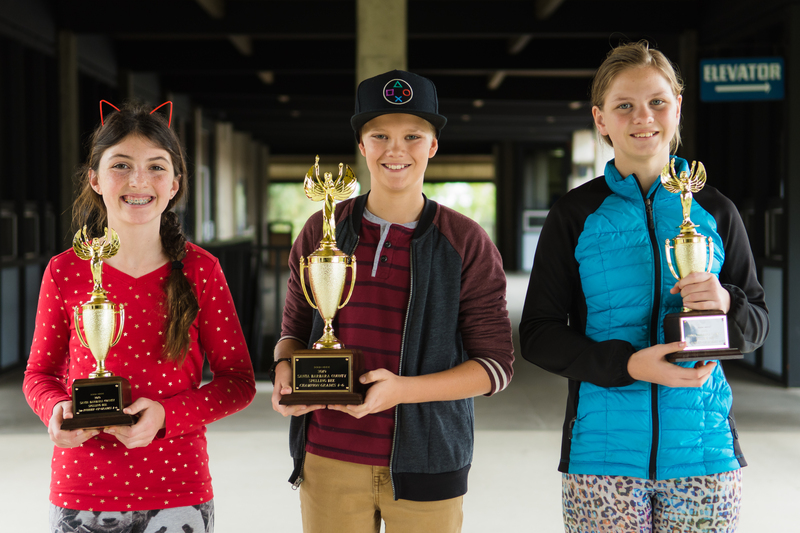 At the Santa Barbara County Spelling Bee earlier this year, four students earned invitations to the statewide competition coming up in May. At the elementary school level, Cold Spring School 6th grader Hudson Bonsignore (center) won first place by correctly spelling “bureaucracy.” Montecito Union School 6th grader Anna Butler (right) took second with “impersonator.” Third place went to Vieja Valley School 6th grader Maxine Nocker (left) for “inflammable.” As the top-two finishers, Bonsignore and Butler have been invited to the state comp next month at the San Joaquin County Office of Education, in Stockton. In the junior high division, Goleta Valley Jr. High 7th grader Victoria Chen (center) won by spelling “acquiesced.” Second place went to Carpinteria Middle School 8th grader Conrad Stinson (right) for “annihilate.” Aria Nafziger (left), an 8th grader from Our Lady of Mt. Carmel, landed in third by spelling “emollient.” Chen and Stinson advance; the state comp runs next month in San Rafael at Miller Creek Middle School.